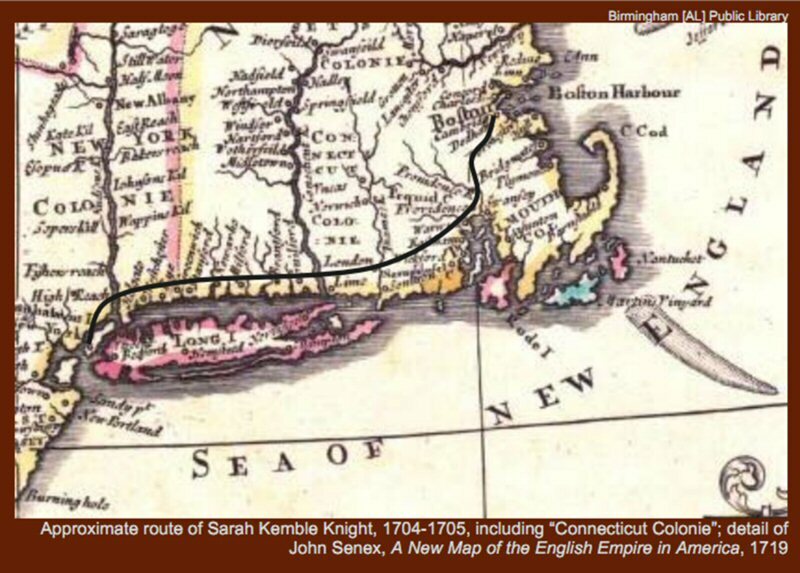 Sarah Kemble Knight was born in 1666 in Boston. She is remembered in particular for her five month journey from Boston to New Haven in Connecticut in 1704. She did the journey on horseback, something unknown for a woman at that time, to “settle the estate of her cousin”, on behalf of his widow. In 1703 she was left a widow and took on the responsibility of her household and in 1706 opened a boarding house and school which gained a reputation for excellence. She had also gained some knowledge of the law of the land hence her journey in 1704. She used this to write letters on behalf of others on court matters, another source of income for her. She moved to New London in 1713 with her newly married daughter and from there became involved in land and owned several farms and on her death in 1727 left her daughter a considerable estate demonstrating her business acumen. She kept a journal of her journey which she described in detail providing us with a historic document of the times. Her journey was difficult and dangerous and episodes were recounted as well as much about how disgusting the food that she was offered often was. It is also interspersed with poems and is considered by some in literature figures to pre-date the character and humour of American writer like Mark Twain. It clearly demonstrates Sarah’s courage, independence and energy that she survives the journey. The Journal of Madam Knight is considered to be an historical and literary document, providing important information of life in the colonies including the social norms of the time. The journal remained in private hands until 1825 when it was published.